The Time Mom Met Hitler… reminds me of when you are having a good time at a party and manage to hold a group of people’s attention for a minute. However, your opening takes a bit too long as your anecdote takes a turn for the worse. You ramble your way through your raft of jokes, leaving your audiences perplexed and hoping you will just get to the point. The Time My Mom met Hitler… follows the life of Dikkon Eberhart, the son of the Pulitzer Prize-winning poet laureate, Richard Eberhart, from childhood to adulthood. It shines a light on the literary luminaries who graced young Dikkon’s house (Robert Frost, Dylan Thomas, W.H. Auden among others) and the struggles that follows as he grows and strives to follow in his father’s footsteps. The book reveals Dikkon’s spiritual journey from what he calls a “Godian” to Judaism and then to Christianity. In this tapestry of tales is an exposition of interactions and politics among writers and poets as well as their financial and health struggles. Dikkon also tells of his mother’s loss of memory as she grew old and his father’s struggle to come to terms with it. All in all, the book deals with the process of aging and the truth about coming to terms with our own mortality. The Time My Mom Met Hitler… starts slowly. Actually the story did not kick off until Chapter Sixteen, which is a shame because the latter parts of the book contains some good stuff. Dikkon spends the early chapters on details of famous poets he spent his childhood rubbing shoulders with. He also touches on his childhood school antics, his father’s political views and his career escapades during the war, and his Mom’s brief meeting with Adolf Hitler. These details, unfortunately, are incoherent and lack enough focus to hold the reader’s attention. The book does well in illuminating Dikkon’s personal struggles (family and spiritual) as well as his turmoil about following a path different from his father. The section on Richard Eberhart and his wife’s last days is written beautifully and very touching. The Time My Mom Met Hitler… is a fine book hampered by irrelevant details. However, the ultimate reward comes if you manage to push through to the middle pages where the real meat of the story is. 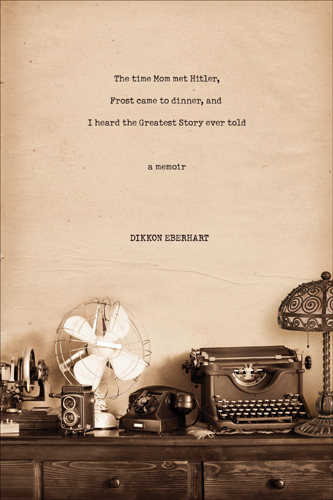 The Time Mom Met Hitler, Frost Came To Dinner, And I Heard The Greatest Story Ever Told is written by Dikkon Eberhart and Tyndale House Publishers, Inc. (June 23, 2015). Many thanks to Tyndale House Publishers, Inc. for review copy. All images are © to their respective owners.